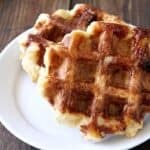 Homemade Belgian Liège Waffles, an easy authentic Belgian Sugar Waffle recipe! This easy from scratch Belgian waffle results in the best crispy Belgian waffles that are soft on the inside. 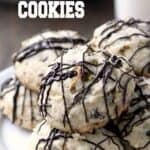 Perfect with your favorite toppings! Oh how I love waffles! Remember my Chicken Stuffed Waffle Pops that I made on Rachel Ray awhile back? Yum! My family and I went to NYC earlier this year for the day like we do frequently. We always love trying new restaurants and food and generally eat WAY more than we should when in NYC. Basically we just eat our way through the city every.single.time. I’m not complaining though. We had the BEST Belgian Waffle I’ve ever had! I was so jealous that their waffles were so much better than the waffles I made at home so I was on a mission to up my game and do some research when I got home. This authenic Belgian waffle recipe is the best if I do say so myself. PEARL SUGAR! <—Check it out on Amazon to see what I’m talking about. 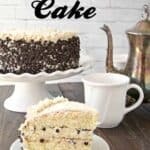 It is NOT granulated sugar, so PLEASE do not substitute regular granulated sugar. You will not have the same results. Pearl sugar is like little chunks of sugar much more coarse than granulated sugar. I have heard of people buying sugar cubes at their grocery store than putting it in a food processor and pulsing until smaller chunks. I haven’t tried that myself so can’t say how it compares. To start though, I’d highly recommend the pearl sugar so you have something to compare it too. Next you’ll need a good Belgian waffle maker. I have this one–> Belgian Waffle Maker. I love it, works great, and creates thick square Belgian waffles. However, if I was in the market for a new one, I think I would look for one that has removable plates like this one –> Removable Plate Belgian Waffle Maker. Any Belgian waffle maker will work. I personally like square waffles. I don’t know why that is, but just a weird quirk I guess. Ha! Just make sure your waffle maker makes THICK waffles. I don’t think this will work as well with a regular waffle maker so I highly recommend a Belgian waffle maker. 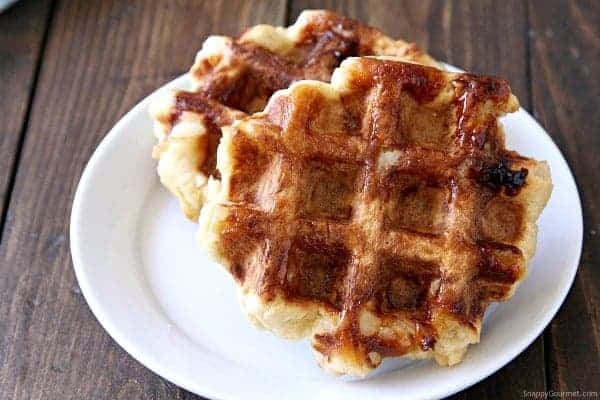 What’s a little different about the Belgian waffle recipe for Belgian Liège Waffles (sugar waffles) is that it makes more of a DOUGH rather than a Belgain waffle batter. You divide the dough up into balls, then place the dough balls in your waffle maker. The pearl sugar seems to burst and melt, creating a crispy and almost sticky outside which is delicious! I could eat these all day long. 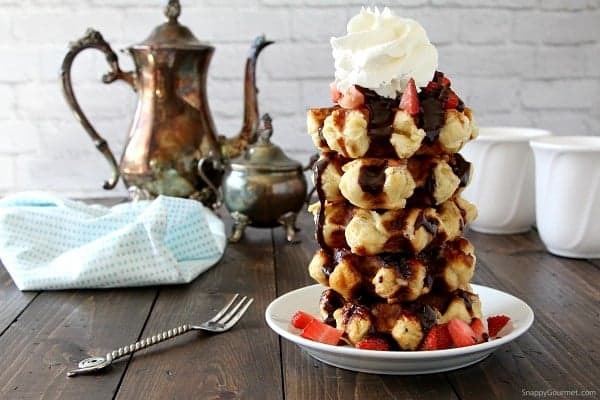 SO much better than a batter Belgian waffle recipe in my opinion! These Belgian Sugar Waffles were actually simple and easy to make but did take a little bit of time. The dough does need a little time to rise because of the yeast. 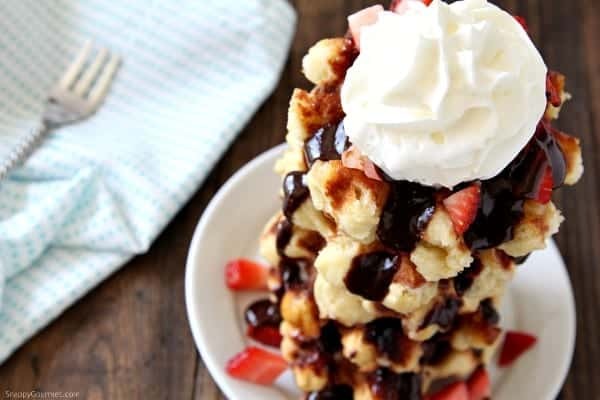 Top the Belgian Waffles with your favorite toppings like maple syrup, chocolate sauce, caramel sauce, fresh fruit, fruit sauces, whip cream, ice cream, or just a a little powdered sugar. This Cinnamon Banana Sauce would be really good, as well as this Strawberry Sauce. 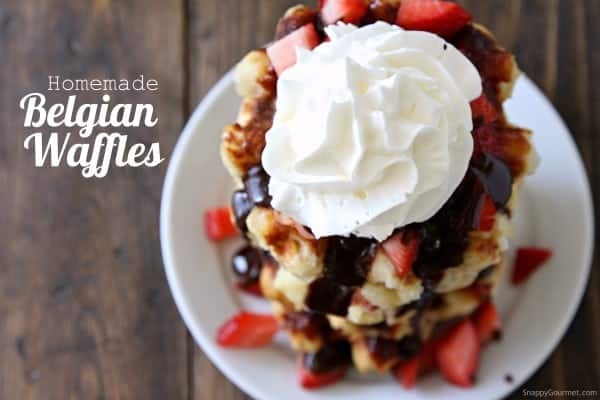 Hope you enjoy these delicious from scratch Belgian Sugar Waffles! 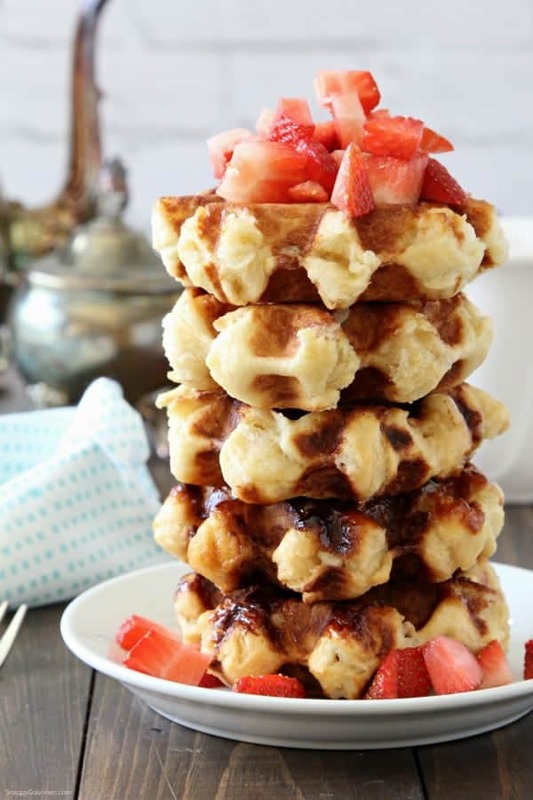 Easy from scratch Belgian Liege Waffles that are crispy on the outside and soft on the inside. The best homemade waffles! Place warm milk in a large bowl. Whisk in yeast. Let sit about 5 minutes. Stir in flour, butter, eggs, salt, and vanilla into yeast and milk until well combined. Cover bowl and let rise until dough is about double in size, about 30-60 minutes. When dough is about double in size, mix in pearl sugar. Lightly grease your waffle maker then preheat according to manufacturer directions. 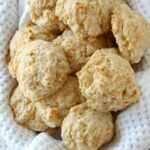 Divide dough into balls about 2-4 ounce each. Place dough in batches in your waffle maker. Bake waffles for about 3-5 minutes or until golden brown and crispy. Top with your favorite waffle toppings. SNAPPY TIPS: Be careful that your waffle maker is not too hot or the sugar may burn. You may need to experiment a little with your particular waffle maker. These waffles freeze great and can be reheated in the oven. SNAPPY SUBSTITUTIONS: Do not substitute other types of sugar for the pearl sugar because you will not get the same results. 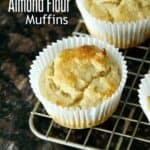 Instead of vanilla, you could try other types of flavored extracts such as almond. This is such an amazing day starter! 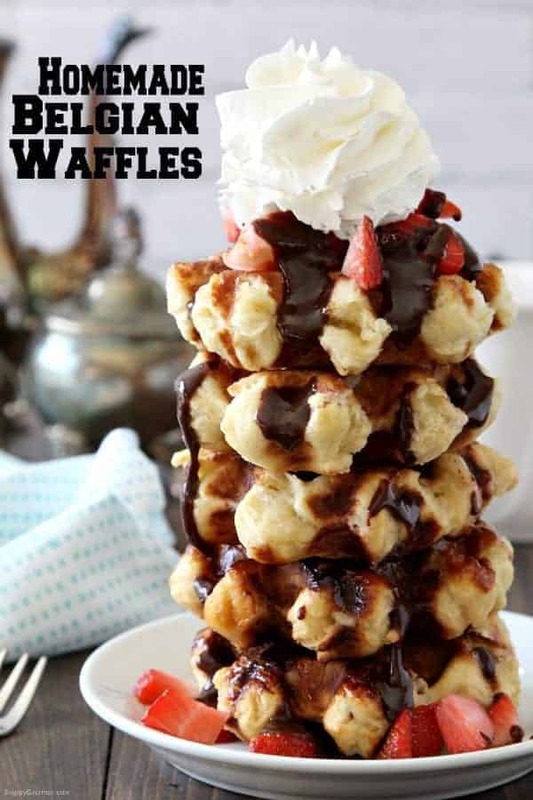 That’s the best looking stack of waffles I have ever seen! What a fun family breakfast! Bought a jar of yeast and realized it was .25 oz only after adding 1oz yeast! 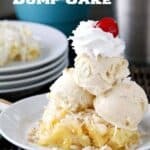 Please amend the recipe (it says 2.25oz) but otherwise great recipe! Just made a batch and waiting to actually cook them! Exciting stuff. 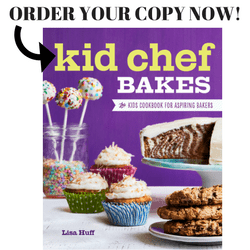 Can you put the dough in the fridge and keep it for a while? Since there is yeast in the dough, I’d be careful storing it too long. I simply love Belgian waffles, delicious served with satled caramel sauce, banana and cream. I always associate Belgian waffles with the round design. Interesting to read about the choice of sugar being a key part of the result. Isn’t it funny how it can make all the difference. 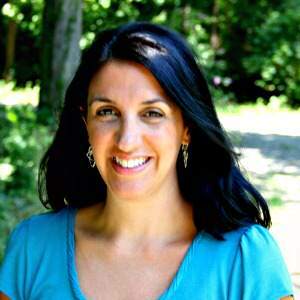 Lisa, these are beautiful! I’m printing this recipe…and then finding a friend with waffle maker (b/c yes, I’m the only person who doesn’t own one LOL). 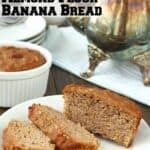 Such a great recipe…thanks for sharing! Ahhh so jealous, I am still itching to go to NYC to eat my face off! haha :) I can only imagine all the fun and foods you had! I am SO intrigued from this pearl sugar you speak off. I will definitely be picking up a package of this to play with!